Neighbours went up and down the stairs and stared into the apartment. Not one of them crossed the threshold except Clarissa Engelhardt, a student who lived with her parents on the first floor. She gathered up shards of glass from the floor and put them in a washbasin. A grey-haired, bespectacled man appeared in the doorway, coughed and wiped his nose with a handkerchief. He leaned over Frau Stein. Feathers clung to his clothes and his neck, and from time to time he brushed a dusty feather away from his face, where the wind, swirling through the room, had blown it. ‘I’m allergic to feathers,’ apologised the doctor, who must have been summoned by the neighbours. Thomas didn’t know him. It was a good thing they hadn’t called in Doctor Spengler, that romantic soul who became attached to his patients and mourned for them. Even the dying had to hear about the suffering of the poor souls who had been buried the previous week. The doctor stepped to the window and shouted something, and soon two men came in, picked up Frau Stein’s body and carried it outside. Only her high heels remained. Seeing them, Thomas remembered how she had crossed the city that morning to come here. She had doubtless walked for hours in those fine shoes that his mother had bought her for her fiftieth birthday, and in her best dress. Had she intended to ask for help? Jews were turning to everyone they knew. She had probably remembered that he worked for an American company. Maybe she had planned to coax his mother into asking for his help. For the next half-hour he took care of Frau Stein’s body, surveyed the damage and tried to work out what to do, but he didn’t dare approach his mother’s room. A voice in his head shouted that he was in danger—he would be asked to explain why a Jewish woman was in his house—and he knew he had to think things through. If he saw his mother now, he would lose any chance of remaining lucid. Between his encounter with Hermann and his gang and climbing the steps to his house, he understood that his mother was no longer living. Any faint hope was snuffed out as soon as he crossed the threshold. He had never felt anything with so much certainty as the fact of her death. When he came home from school and knocked on the front door, he always knew by the sound of Frau Stein’s heavy steps whether or not his mother was at home. ‘Where is Frau Heiselberg?’ the doctor asked. Thomas stared at the man who was streaked with feathers and flour. The doctor shook him and slapped him. His hands were damp. Thomas was afraid that the source of the dampness was Frau Stein’s blood. He pointed down the dark corridor at the only door that remained in the house. The doctor disappeared down the corridor, and in a few minutes emerged from the darkness. Thomas reached out and dusted away some feathers that clung to his lapel. ‘It’s all right, Herr Heiselberg,’ the doctor said. He doesn’t remember how he got to her room. Maybe they dragged him there. She lay on her bed in a nightgown, and pallor had already spread on her face. Her head rested on two pillows, her sculpted neck was slightly stretched, but it didn’t violate her tranquil expression. She seemed to have gone to sleep. Her arms were crossed on her chest, and her lower body was covered by a sheet. He cautiously approached the corpse, struggling with the fear that he would be called upon to explain why he had invaded her room in the middle of the night. He shouldn’t have left her with Frau Stein. His fingers crept along the sheet and touched her arm. They were even colder than her skin. He brought them to his lips and blew on them. Then he touched her arm, and let his fingers rest there. He didn’t dare touch her face. The questions that Erika Gelber would ask him were already whirring in his mind: Did you kiss her goodbye? Were you afraid of her dead body? At last he gave a wild shout, shook off his fear and in one movement he leaned down, kissed her forehead and straightened up. Then he retreated until his hand felt the doorhandle. He went out, shut the door and stood in the dark corridor. There he stood until dawn with his back to the closed door of her room. In the morning he hired the services of Clarissa Engelhardt, and placed the reorganisation of the house in her hands. Plump Clarissa agreed to his proposal even before asking her parents’ permission, ‘out of respect for Frau Heiselberg’. He moved into a hotel near the Milton offices. When he returned to the house two weeks later, not even a hint of that night remained, except for the space that yawned in his mother’s room where the window had been. He had ordered Clarissa not to repair it, and she reluctantly obeyed. No official contacted him regarding the events of that night. About a hundred acquaintances and the entire staff of Milton attended the funeral. Some clients also attended, as well as representatives of government offices, the Four Year Plan, the Berlin municipality, and the French and Italian embassies. Georg Weller, the fellow from the Foreign Office, and two SD agents who worked with Carlson Mailer also came. Rudolf Schumacher showed up with a telegram from Walther Funk, the Minister of Economic Affairs. Schumacher had doubtless managed to boast to him about his connections with Milton, Thomas thought irately. The man was an amateur. The way people like that got on was what Thomas’s father called ‘wriggling through’. The presence of people from the government alleviated his anxiety. It had apparently been decided to erase any memory of the incident. He heard that savage criticism in the foreign press of the attack on the Jews had irritated the government. Words like ‘unnecessary’ and ‘stupid’ were used openly amid claims that people had acted behind the Führer’s back and betrayed the trust he had placed in them. Nevertheless, Weller, who called him up a few weeks after the funeral to find out how he was, told him that in December the Foreign Minister von Ribbentrop had been warmly received in Paris, that the French Foreign Minister had made anti-Jewish remarks and that everyone understood that what happened that night was merely a temporary glitch. After all, very few Jews had been killed. Weller, who, to Thomas’s surprise, knew all about the event in his house, did not believe any action would be taken against him: the Foreign Office would not allow anyone to harass a protégé of Jack Fiske. How many friends like Fiske did Germany still have in the United States? ‘If Friedrich Nietzsche and a Hollywood starlet sat next to Elsa in a café, she would turn her back on the philosopher,’ his mother declared the day she met her. A few years later she boasted to Frau Stein that she and her son had got rid of their spouses at the same time. None of the mourners mentioned that night. ‘What a cursed sickness,’ one of the SD men said. Thomas silently agreed with him; his mother had died of her illness. No one had injured her. Of course the invasion of her house would have terrified her and hastened her death, but, to tell the truth, it also shortened her suffering. He had not seen Hermann since. Sometimes the question gnawed at him: why had he done it? But, instead of letting it get to him, Thomas started planning how he could retaliate. He remembered that when they sold off Hermann’s father’s possessions or food stolen from hotels, Hermann was embarrassed and would complain about their damned country that forced him to act like a criminal so that his sisters wouldn’t starve. Hermann never concealed his distaste for Thomas’s practice of ‘swindling people’ (though he didn’t turn up his nose at the fruit of the swindles), and the moment came when their friendship began to leach away. That didn’t worry him: lots of boys swore fidelity to one another and got bored after a month. But even if Hermann now saw him as someone who had ‘sold his soul to the Americans’ and nonsense like that, it was still hard to understand the hatred in his eyes or that he had violated a house where he had played as a boy. One day Thomas decided there was no point in thinking about the kinks in Hermann’s soul. Taking revenge on an SS officer might lead to his own destruction. Perhaps Hermann felt that they were even now and wouldn’t see each other again. But Thomas had to keep an eye out: he wouldn’t let Hermann take him by surprise again, make him stand in the street, trembling, humiliated and ignorant. Next time he would land the first blow. 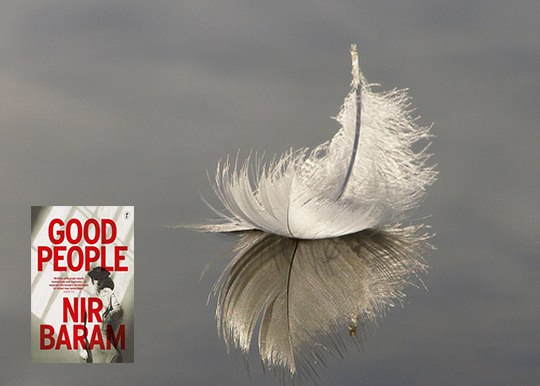 Nir Baram’s Good People will be out in bookstores next month. Click here for more information about the book. Nir Baram was born into a political family in Jerusalem in 1976. His grandfather and father were both ministers in Israeli Labor Party governments. He has worked as a journalist and an editor, and as an advocate for equal rights for Palestinians. He began publishing fiction when he was twenty-two, and is the author of five novels, including The Remaker of Dreams, Good People and World Shadow. His novels have been translated into more than ten languages and received critical acclaim around the world. He has been shortlisted several times for the Sapir Prize and in 2010 received the Prime Minister’s Award for Hebrew Literature. Text will publish a work of reportage by Nir Baram in 2017. Jeffrey Green is a writer and translator living in Israel. He has a doctorate in Comparative Literature from Harvard, and has also published, among other things, a novel in Hebrew, a book of poetry and a book about translation.